It is a great consolation for souls who walk in the desert of life and who are travellers in this world, to often consider the Blessed Virgin as a traveller. God did not only want her to live in the land of Palestine and in this small house of Nazareth where she led such a poor and hidden life, but He permitted her to leave it to make many journeys which are spoken of in the Gospel. 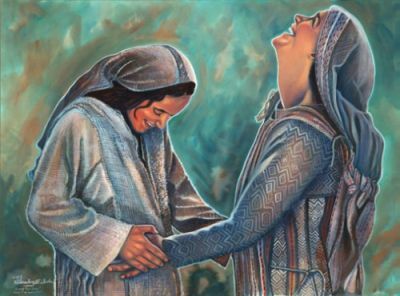 The first is that of the Visitation, where, carrying Our Lord Jesus Christ, profoundly recollected in Him, she left to show her charity, her affection, her devotedness to her cousin Elizabeth, mother of John the Baptist, the great prophet. The Blessed Virgin remained recollected within herself and carried to those outside the fruits of the Divine presence that she possessed in her heart. It was by this, above all, that she exercised charity. She was so dependent on Our Lord, so united with Him, so completely under the action of grace; she was so well the beloved daughter of the Father, the mother of the Son, she maintained such intimate relations with the Holy Spirit that she communicated in this simple act a highly eminent grace. See how the Blessed Virgin has hardly spoken. The Gospel relates her Magnificat, but this is a canticle of praise. Apart from this canticle, the words of Mary are strikingly few in number. It was by her union with God, by humility, by the grace that she spread good and practiced her eminent charity. We should ask God, during this feast of the Visitation, that we also may know how to practice charity in peace, in patience, in union with Him, in good example, in the renouncement of the "I", in the radiation of a living faith, that which at all times, in all places, enables the brightness of God to penetrate us, to envelope us and be spread around us. Let us also pray to the Blessed Virgin for she is very eager to grant us this grace - she who led such a humble, hidden life; she who did not seek to be seen or esteemed, she who did not preach, who never made long speeches. Let us ask her that, giving us the grace to imitate the holiness of her life, she may thus make us practice charity more than anything else.